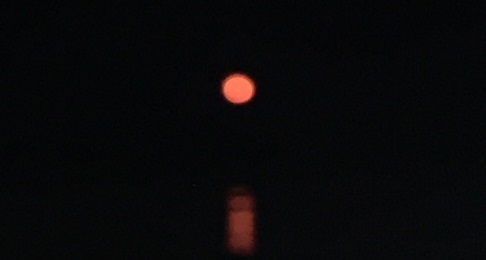 The only "supermoon" for 2017 provided a beautiful orange orb to appreciate as it rose over the Hobcaw treeline across the bay on December 3rd. A "supermoon" occurs when a full moon is closest to Earth in its elliptical orbit. The moon was actually closer to the Earth back in May but it was not a full moon and, therefore, not a "supermoon". Michael Dollason captured this image on his phone, zooming in when the moon cast a wide reflection on the water. Beautiful sunrises, moonrises, sunsets, and night moons are just a few of the reasons Belle Isle is such a beautiful place to spend time. If you haven't checked out the Photo Gallery lately, click on this link to the Gallery and see the images you can download. Everyone is encouraged to contribute your favorite Belle Isle images. Images will be periodically used in the design of webpages on this website, and flyers.